In a small saucepan, bring the water, vinegar and sugar to boil. Stir to ensure the sugar is dissolved. Set aside to cool. In a large bowl, put water and 2 teaspoons of salt. Peel and slice the cucumbers and onions. If you prefer to leave the cucumber peel on, or partially peel for additional color, that works, too. 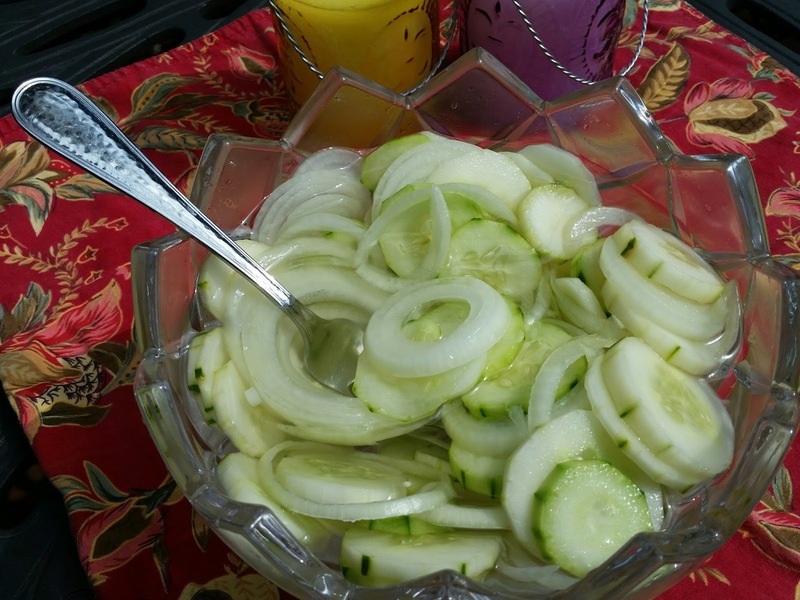 Place the sliced cucumbers and onions in the water bowl, ensuring all the slices are covered. After the vinegar/sugar/water combination has cooled to room temperature, drain the salt water off of the cucumbers and onions. Pour the cooled vinegar water over the vegetables. Cover tightly and refrigerate. Allow to soak at least a couple of hours before enjoying. This entry was posted in Lookout Point Lakeside Inn, Soups Salads and Appetizers, Vegetables and Potatoes by admin. Bookmark the permalink.